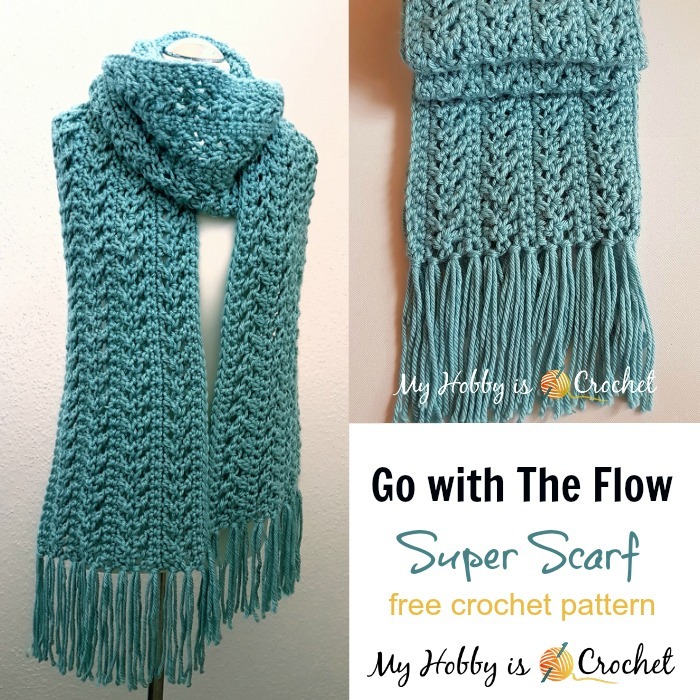 "Go with the Flow" Super Scarf has a nice drape and a wonderful texture made with a combination of front and back crossed double crochet stitches. 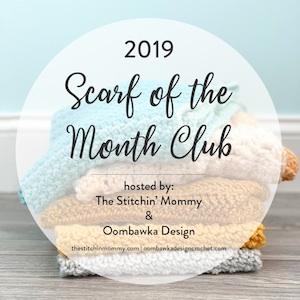 Worked lengthwise with a soft and chunky yarn, this scarf will be a quick project that you will love crocheting and wearing! This super scarf pattern is my contribution to Red Heart Joy Creators Super Scarf Blog Hop. You can find the schedule at the end of this post. Flat measurement without blocking: approx. 9.5" [24cm] wide x 84" [215 cm] long, excluding fringe. 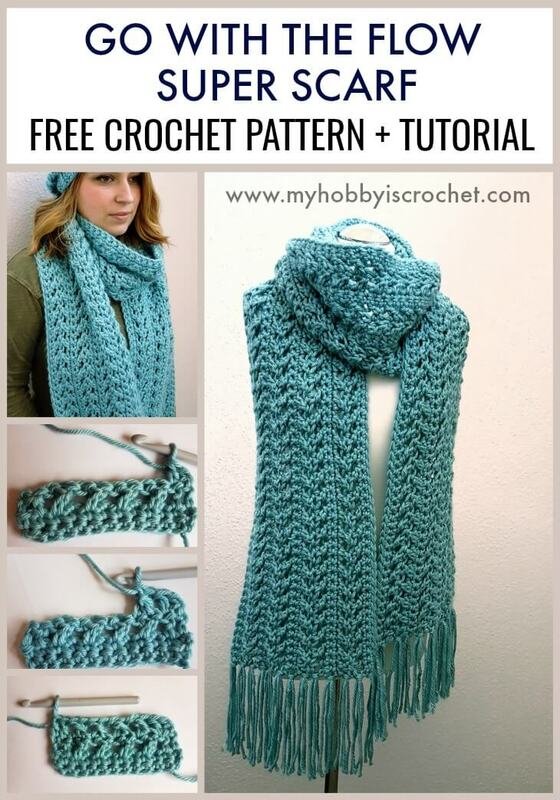 For a longer scarf start with more foundation chain stitches. For a wider scarf add more rows in the pattern repeat. (Note: From the 4th skein I have used only a small amount of yarn). - back bump of chains. See my picture tutorial for the back bump of chains. By working the variations of the crossed double crochet stitch shown below, you will get stitches, which although crossed, are not entangled with each other. 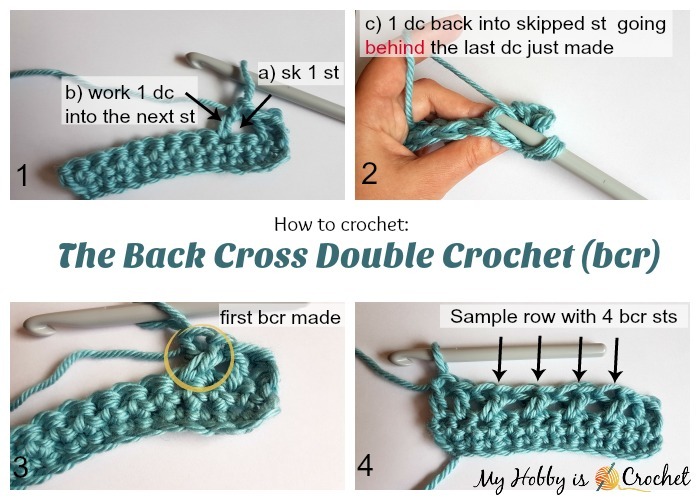 One crossed double crochet is made of 2 dc sts! 1) Back Cross Double Crochet (bcrdc): sk 1 st, work 1 dc into the next st, 1 dc back into skipped st going behind the last dc just made.For the stitch tutorial of the bcrdc see the photo collage at row 3 in the pattern below. 2) Front Cross Double Crochet (fcrdc): sk 1 st, work 1 dc into the next st, 1 dc back into skipped st going in front of the last dc just made, so as not to catch it. (For the stitch tutorial of the fcrdc see the photo collage at row 4 in the pattern below! 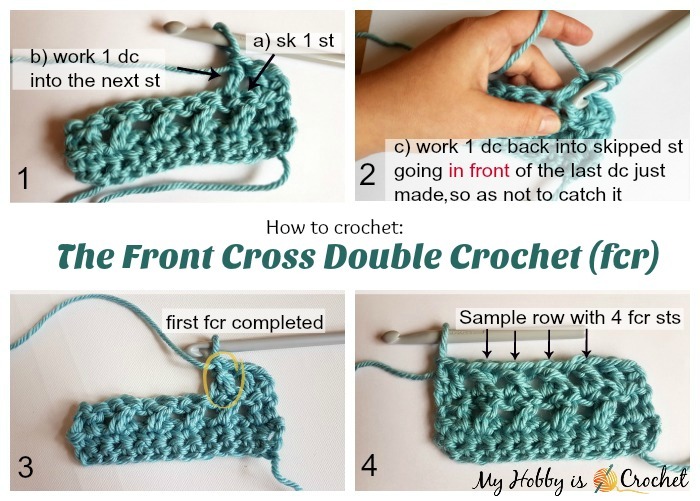 I have not found a video tutorial for exactly this way of doing the front cross double crochet. All the tutorials out there are for crossed double crochet made out of stitches that are entagled with each other. I hope my photo tutorial will help you! 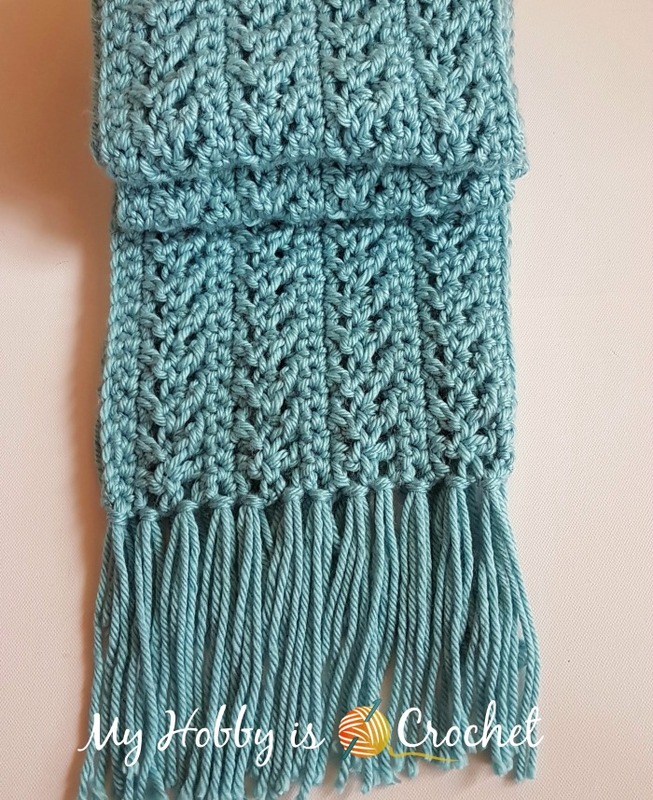 I have noticed that it was easier for me to work the front cross double crochet inserting the hook into the skipped stitch from back of the work to the front. Note: For joinining a new skein of yarn, I have used the Russian Joining Method without a visible knot. Row 3: (back cross double crochet row): ch 3 or csdc (will count as the first dc), turn, 1 dc in next sc, work bcrdc sts across the row to the last 2 sts, ending the row with 1 dc into each of the last 2 sts. Row 4 (front cross double crochet row): ch 3 or csdc (count as first dc), turn, 1 dc in next sc, work fcrdc sts across the row to the last 2 sts, ending the row with 1 dc into each of the last 2 sts. As you can see in the picture no.4 of the photo collage above, when alternating a row of back cross double crochet (row 3) with a row of front cross double crochet (row 4), you get a braid kind of look (when rotating the scarf to the vertical). If you work correctly, the fcrdc sts should align with the bcrdc sts! Rows 7- 18: repeat rows 3 - 6. Basically you will alternate 2 rows of single crochet sts with 1 row of back cross sts + 1 row of front cross sts, ending with 2 rows of sc sts.Fasten off. Weave in the ends. I hope you enjoy this pattern! Don't forget to check the matching Go with the Flow Hat! 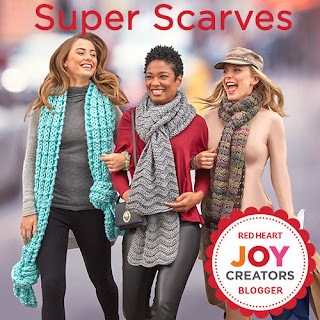 Check out the Red Heart Joy Creators Super Scarf Blog Hop hosted on Red Heart Yarn Blog! This pattern is free for you to use, you can sell the products of your work, a link back to my blog would be appreciated.